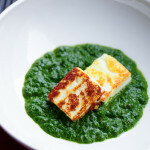 Yogurt is an integral part of Indian meals. 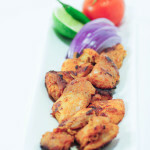 It is a vital component of many Indian recipes – acting as a tenderizer, marinade, sauce base and flavor agent. 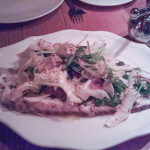 We use yogurt in a myriad of ways in our day to day cooking. Throw it in a blender with ripe mangoes for a glass of frothy, delicious lassi. Tenderize your meats and flavor your marinade with a spoon or two of yogurt. Temper the spice of your biryani, with a raita made with cucumbers and yogurt. The possibilities are endless. I have to admit though, eating plain yogurt isn’t really my thing. I dislike the sour, tangy flavor of most store bought yogurt, so the only way I could stomach it was by mixing in several spoons of sugar. Seeking an alternative to store bought yogurt, I once attempted to make yogurt at home. I thought I did everything right – heated the milk, added culture, left the bowl undisturbed in a warm area of the house. The results were nothing short of disastrous. The yogurt showed no signs of setting and had a strange partially coagulated texture. It was painful throwing away all that milk and I thought that was the end of my yogurt making days. It took a visit from my mother in law to discover how easy it is to make yogurt. Her method had proven foolproof. All I need to do is get the proportions and temperature right. For the past 9 months, even in the dead of this horrible winter, I’ve been making excellent batches of yogurt every week. Take that, polar vortex! I’d like to demystify the technique of making your own yogurt and I hope you can use it as successfully as I have. 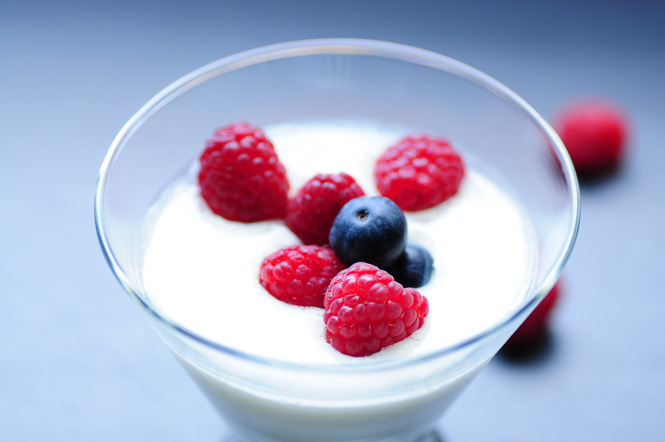 Yogurt is formed when bacteria consumes the lactose in the milk (sugar) to create lactic acid. Lactic acid causes the protein in the milk to coagulate creating a thick texture and tangy taste. So, essentially, yogurt making is really about controlling how the bacteria interacts with the milk. Thankfully, this isn’t as hard as it sounds. The first step is to find a culture – i.e. a spoon of yogurt that has active (harmless) bacteria, which when introduced into warm milk will work its magic. You can use a spoon of any plain, store bought yogurt with an active culture (e.g. : Stonyfield Organic, Activia) or a freeze dried culture from a health food store. I got mine from my MIL. Next choose what kind of milk you want to make your yogurt with. My technique works for cow’s milk, but I don’t see why it wouldn’t work with goat milk. I do not use fat free milk as I find that a small amount of fat rounds out the tangy effects of the lactic acid. 2% is what I found works best for us, and I suspect full fat milk will be even creamier and richer. 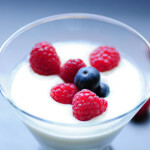 This recipe produces yogurt with a very tender texture which is what we prefer. 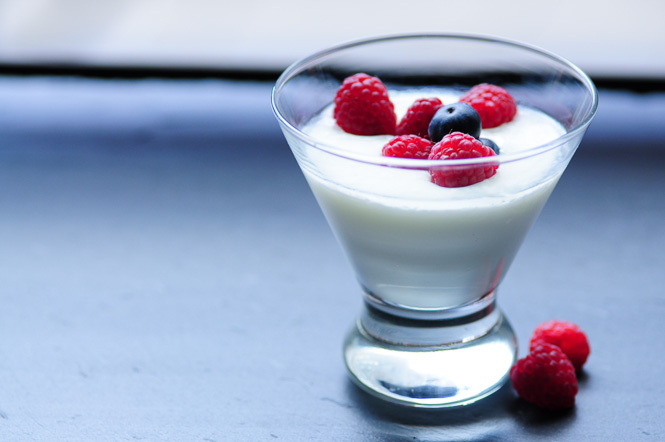 If you want yogurt with a little bit more body, stir in a heaped teaspoon of non fat milk powder into the warm milk prior to adding the culture. The following instructions should help you make your first batch of yogurt. Be sure to save a spoon of your homemade yogurt to use as culture for your next batch. Share your yogurt culture with friends and family – good yogurt karma! Feel free to reach out to me if you have any questions about this recipe. Bring it to a boil on a very, very low flame. This is the second lowest setting on my gas stove. It takes about 20 minutes to bring the milk to low boil. Stir in 5 minute increments. After 20 minutes you’ll start to see bubbles appearing on the side of the saucepan and this is when you should turn off the flame. Take the saucepan off the burner and place near a window to cool. Set the timer to 45 minutes and let the boiled milk cool. After 45 minutes, use a clean spoon to stir the milk and place a drop of the milk on your inner wrist. The milk should be lukewarm – it should not be hot or at room temperature. A more scientific method is to use a thermometer, the milk should be around 110F or 43C. 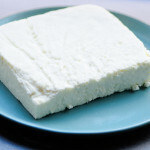 Place the tablespoon of culture in a small bowl and mix it to break up the curd. This allows better incorporation in the milk. Spoon the culture into a clean glass bowl with the warm milk and give it a quick stir. Cover and place in a warm, draft free area for 5-6 hours. In the dead of winter, leave the bowl close to (but not on!) a heater vent. After 6 hours you should see some watery whey on the top of the yogurt, and the thicker curds below it. This is completely normal. Leaving the yogurt to ferment longer than 6 hours will result in additional lactic acid being produced, resulting in a tangier yogurt. Once the curds have set, place your container in the fridge. Refrigeration will thicken the yogurt even more. Yogurt will stay fresh in your fridge for approximately 5 days. As with any recipe involving fermentation, keep your utensils and work area extremely clean. If you happen to burn the milk, please do not attempt to make yogurt with it. It tastes absolutely disgusting – trust me, I know. Temperature control is key. If you introduce the culture to milk that is too hot, it is very likely that the bacteria in the culture will be killed and your yogurt will not set. Even if the yogurt manages to set, the texture will be grainy. Store bought cultures work fine, but if you can get your hands on homemade culture – even better! Ask your friends.